January 15, 1913 saw the opening of Wilmington’s HOTEL DU PONT, one of the most lavish hotels of America’s Gilded Age and an immediate rival to Europe’s finest hotels. In its first week, 25,000 visitors toured the elegant rooms to see its rich woodwork, mosaic and terrazzo floors, handcrafted chandeliers, and gilded hallways, which had been created by a host of French and Italian craftsmen. The DuPont Theatre, located in the corridors of the hotel lobby, was a marvel in itself; even today, it is larger than all but three other stages in the nation. An extensive $40 million restoration has returned the lobby to its original grandeur, and each luxury guestroom has been sumptuously refurbished. 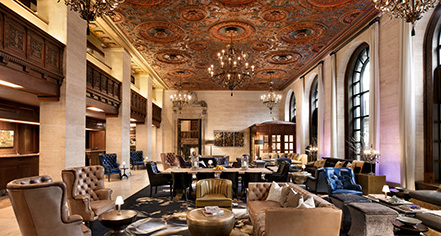 This historic hotel showcases original paintings of nationally recognized artists, including three generations of Wyeths. 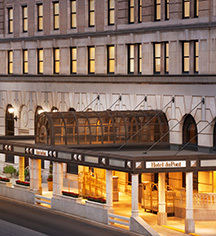 HOTEL DU PONT, a charter member of Historic Hotels of America since 1989, dates back to 1913. HOTEL DU PONT has hosted Prince Rainier of Monaco, King Carl XVI Gustaf and Prince Bertil of Sweden, President John F. Kennedy, Eleanor Roosevelt, and Henry Kissinger. Cancellation Policy: 48 hours prior to arrival. Otherwise the charge is the full rate minus tax. Deposit: Credit card to hold reservation. Early Check-In/Late Check-Out: Early Check-In: Available; no fee. Late Check-Out: fees after 3pm. Hotel/Resort Fees & Taxes: Taxes: State (8%) and City (2%). Occupancy Restrictions: Maximum four (4) persons per room. Pet Policy: Service animals allowed: Yes. Pets allowed: Yes. Fee: $100 per night for registered pet and $150 per night for unregistered pet. January 15, 1913 saw the opening of Wilmington’s HOTEL DU PONT, one of the most lavish hotels of America’s Gilded Age and an immediate rival to Europe’s finest hotels. Learn more about the History of HOTEL DU PONT .